For the treatment of burns, wounds, dermatitis, a specimen of animals (except cats). Ivermek can be applied to cattle, sheep, goats, horses, deer, camels, dogs and cats as a curative and preventative measure against pulmonary and gastrointestinal helminthosis including dictyocaulosis, metastrongylosis, trichostrongylatosis, strongyloidosis, ascariasis, oesophagostomiasis, ascariasis, oesophagostomiasis, bunostomosis etc; thelaziosis (caused by eye nematodes); hypodermosis, oestrosis (caused by bot flies and bomb flies); psoroptic mange and sarcoptic mange (itches); follicular mange; sifunculatosis (lice infestation) and mallophagosis. It is indicated for the females of domestic animals (cows, horses, sheep, goats, sows, dogs, cats) in case of prolonged parturation (hypotension, atony of the uterus); postpartum uterine bleeding; retention of afterbirth; to stimulate postpartum self-purification processes of uterus; in combination with other chemotherapeutic agents – for therapy of endometritis; sows for the treatment of agalactia and to improve allocation of milk. For the treatment of cattle, horses, pigs, sheep, goats, dogs, fur-bearing animals, rabbits, ducks, chickens in infectious diseases, the causative agents of which are sensitive to penicilline. 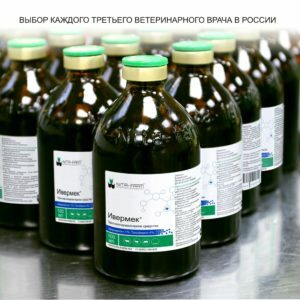 Piro-Stop is prescribed for cattle, sheep, horses, donkeys, mules and dogs with a curative and preventive purpose in blood-parasitic diseases – babesiosis, nuttalliose, anaplasmosis and mixed invasions. Diseases of the hoof and claw where treatment with tar is indicated, hoof surgery, treatment of hoof defects, treatment following regular trimming of hoofs, fastening of hoof dressings and covering bandages. Dermatomycoses in animals, especially in the early stages or during sequential therapy, when the drying properties of tar are manifested favourably. Treatment of cattle, horses, sheep, goats, pigs, dogs, fur-bearing animals (mink, arctic foxes) and rabbits, patients with necrobacteriosis, pasteurellosis, pneumonia, mastitis, wound infection and urinary tract infection, septicemia, phlegmon, and actinomycosis, emphysema Carbuncle and other diseases caused by microorganisms sensitive to penicillins.